I thrive on creative ideas that make StoneGable look updated and beautiful. Instead of more traditional ways to improve our home, I often rely on hacks… inexpensive shortcuts. And the great thing is they work! 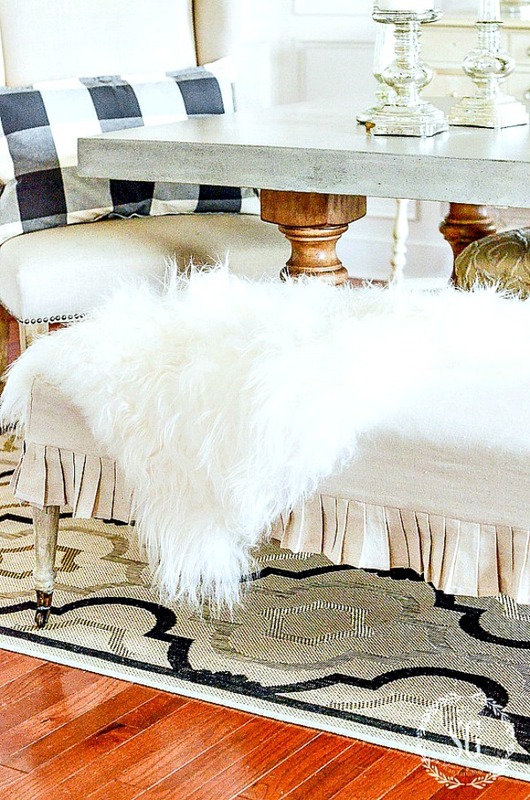 Today I’m sharing 10 home decor hacks that are my favorites! I hope they inspire you to think of creative ways to update your home without breaking the bank! I have a love affair with crown molding! And the bigger the better I like it. But heavy molding can be expensive and very time consuming to up! The back half of our home has nice crown molding but not fabulous crown molding. So we added a thin band of molding place about 18 inches below it on the wall. It gives the walls such nice detail and creates the effect of the molding looking more weighty. This one easy to do hack really makes our molding and walls look extra nice! It really is all about the detail! 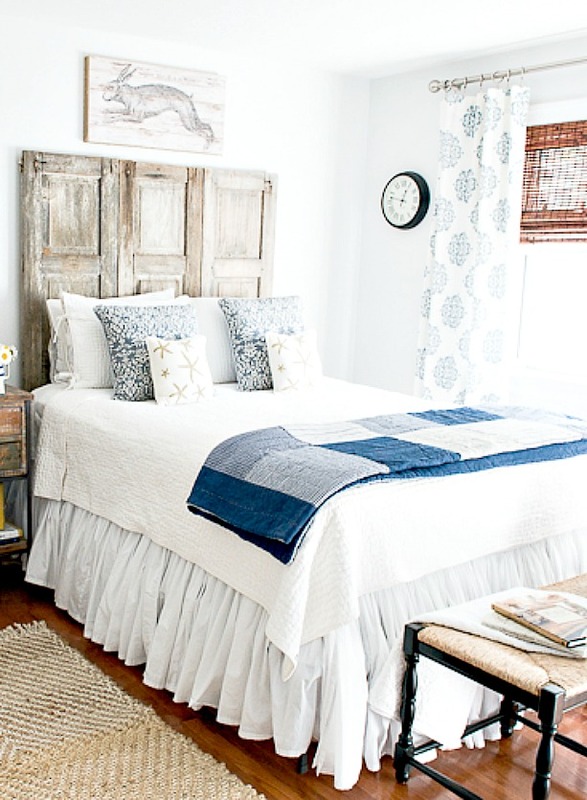 Vintage shutters are still very hot right now and I like to find interesting ways to use them. Instead of buying a new bed for a guest room we bought an inexpensive frame and bolted a few tall old chippy shutters to the wall. Easy peasy! And so unique! We saved a ton of money on a rustic bed for that room! Don’t you love one of a one of a kind thing? 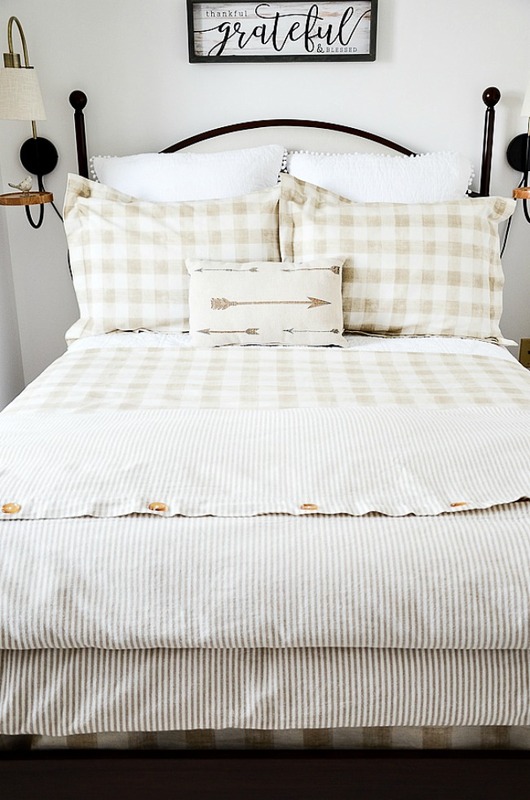 This has become many of our guest favorite bedroom for the bed alone! To create the illusion of taller ceilings hang curtains as high as you possibly can! Even though our ceilings are 9 feet tall I still like the look of taller ceilings! 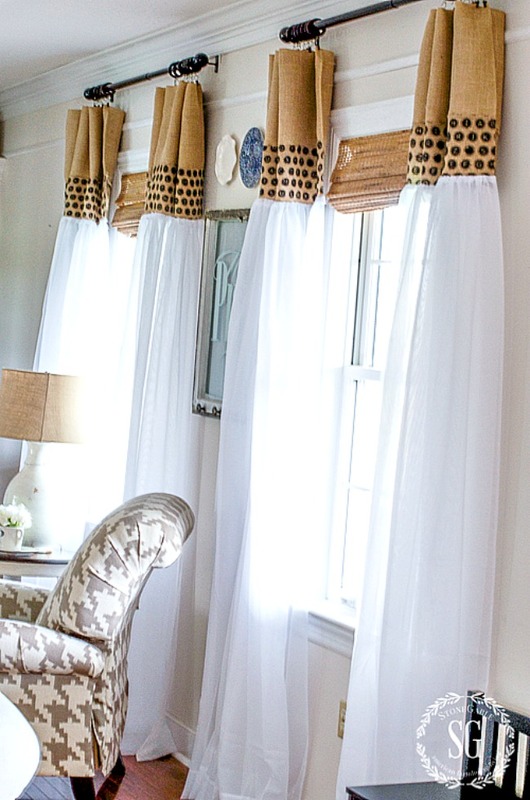 I usually hang my curtains right below our crown molding! 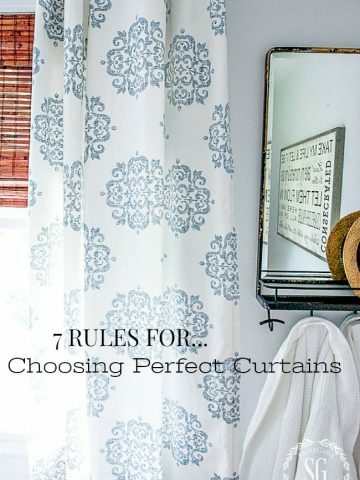 And don’t scrimp on the length of the curtain. Let it at least touch the floor if not puddle a bit. The look of pooling fabric will elevate your room! Another easy decor hack! If you don’t like the color of your banister and stairs why not paint them if you cannot afford to install new ones. New ones for us was not an option so we primed and painted the golden oak banister black. The spindles were already white so we just gave them a fresh coat of paint. We also remove the runner and painted the oak risers white. 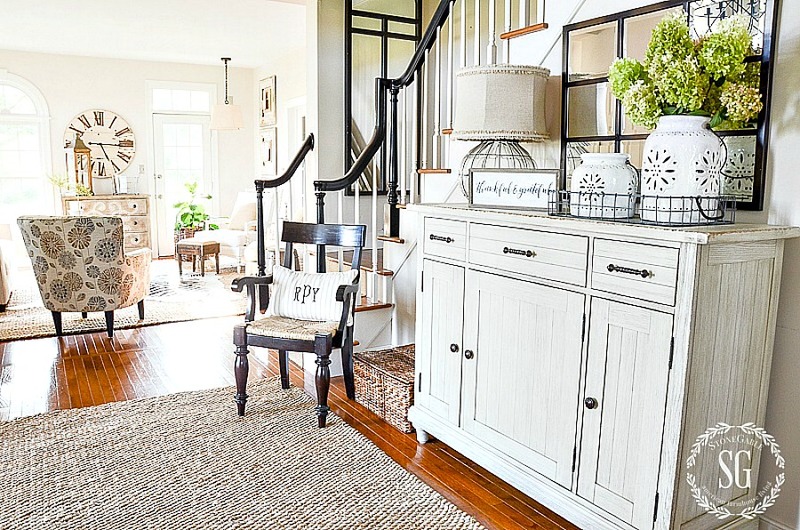 It really toned down the look of the oak and made the whole foyer look a lot more updated! This is such an easy fix it just takes a bit of time and paint! To carry the look I also painted a tall cream colored mirror black to match the banister and added it to the landing wall! Gotta love shiplap! I actually love all kinds of wood textured treatments on walls. 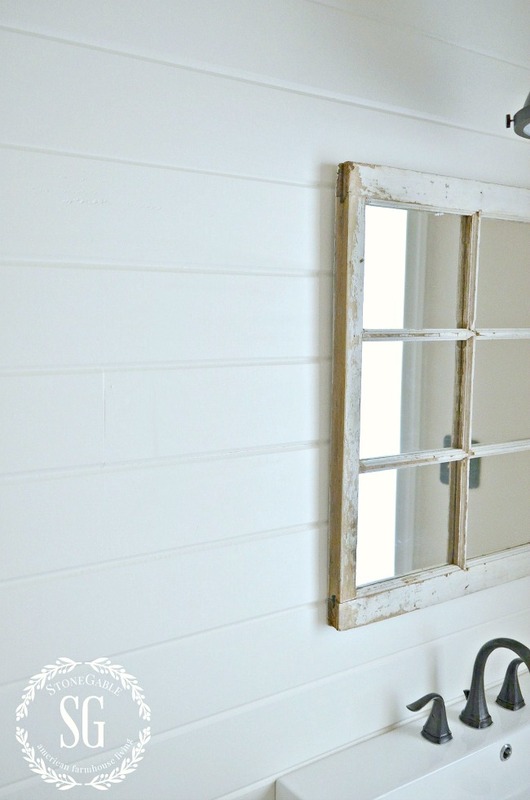 I have such an easy way to hang shiplap!!! The very easiest way ever! NO spacing NO guessing. So easy! This is a great project for an accent wall! To see how to plank a shiplap wall the easy way go HERE. Let’s put down the nailgun and the paintbrush for a few minutes and talk design. Make a room look cozier and welcoming by layering rugs. 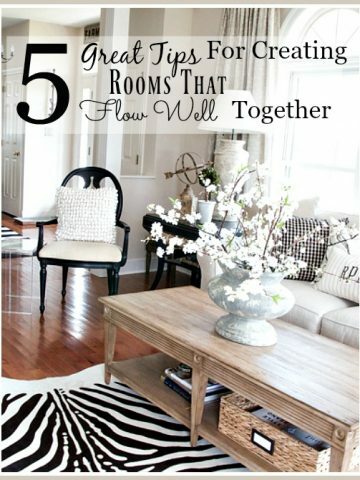 This will make a huge difference in how an entire room will look! 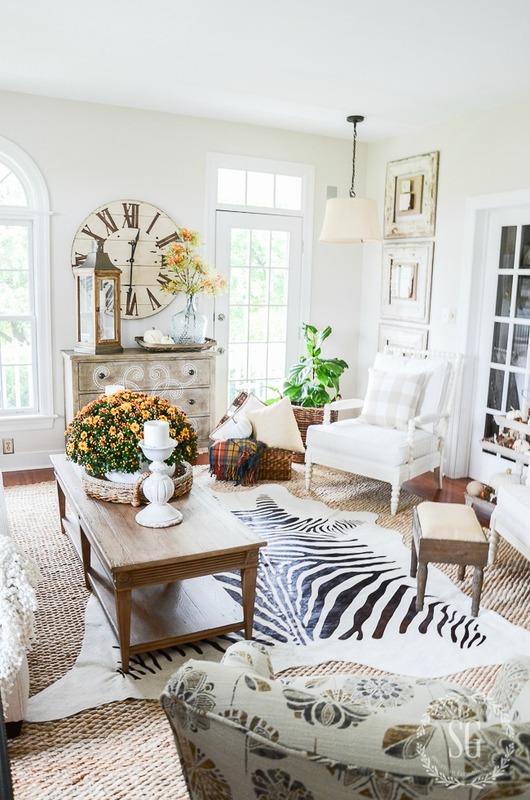 I just could not believe the difference in my living room once I put down a large sisal rug and layered my beloved zebra pelt on top of it! Not even buying a whole room of new furniture could do as much for my living room as layering the rugs! If you cannot afford to get rid of your wall to wall and have hardwoods installed, try adding a great textural rug on top of what you have! When I tell you I have a collection of dropcloths I mean I have several baskets full! I LOVE them. They are the greatest neutral material! 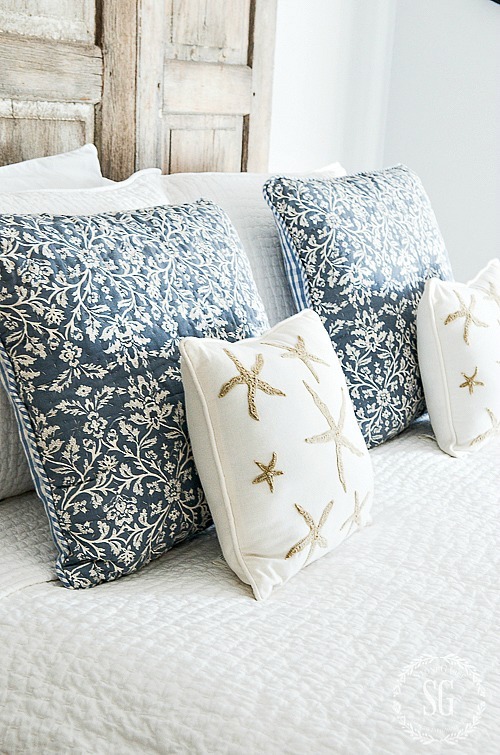 They can be bleached, see HERE, and sewn into slipcovers. I use them to make tablecloths and table runners and placemats and pillows and more! But my favorite way to use them is to slipcover furniture! HERE’S an easy tutorial for slipcovering a bench. Inexpensive, sturdy, beautiful and easy. What could be better? Why, or why did I not think of this before? This home decor hack was such a happy accident! I needed another layer for my Gable Room bedroom. I was looking around my stash and found a duvet cover that was perfect. But it was a duvet cover and not a bedspread. But who would care? Without the duvet, it made the perfect bedspread. So now I look for duvet covers (they tend to have beautiful patterns) instead of bedspreads. Genius right? My mantra to you is “learn how to paint home furnishings”!!! Please! Do yourself a favor and learn. 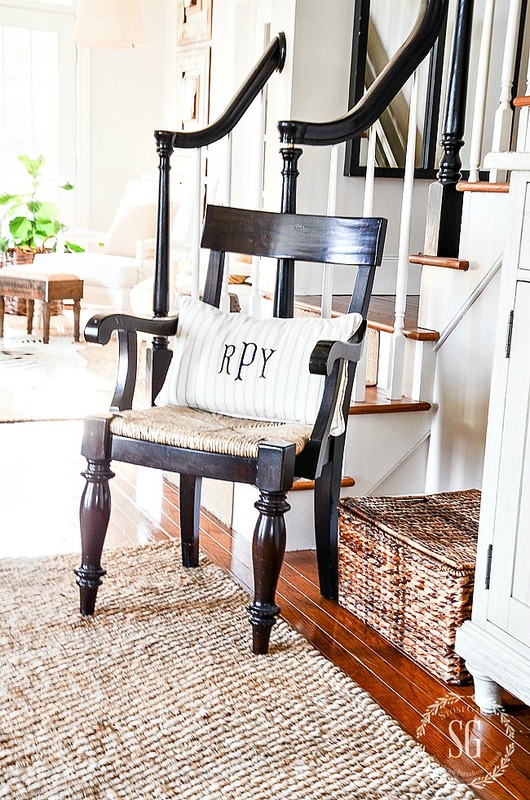 You can create gorgeous one of a kind pieces for your home by picking up a paintbrush. The Venitian Mirrors above were white plastic ceiling medallions from the hardware store. 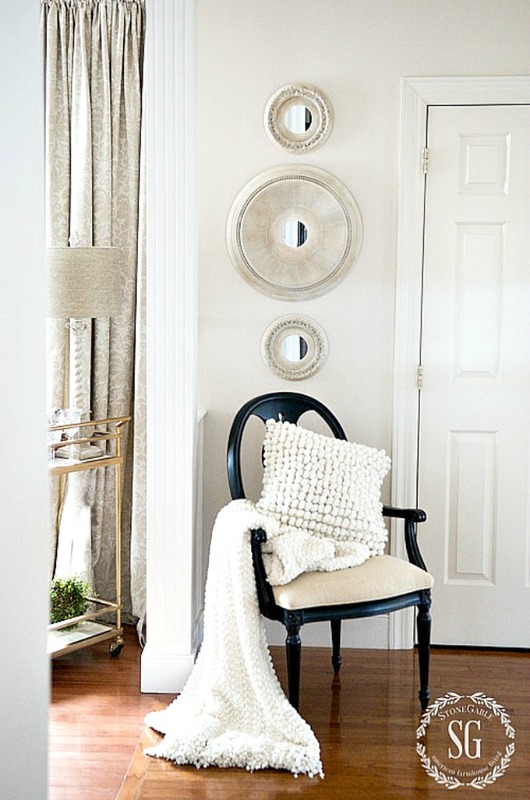 Now they are a trio of extraordinary mirrors! The real deal would have cost thousands and I made all three for under $50.00! A great place to learn how to paint is on youtube. My very favorite paints can be found at Ace Hardware stores. They are from Amy Howard At Home. She also has THE BEST painting tutorials. See them HERE. I painted the large clock above the mantel too. It was a dull and heavy brown. With a little paint and Amy’s YouTube tutorials I was able to save the mirror and make it work with my decor! This was one of my very favorite hacks! Our home is almost 23 years old so we built it in the style of the time. The mantel was made as you see it today, but the fireplace surround and the hearth were dark green marble. And the metal around the marble was shiny brass. Instead of knocking out the marble we just veneered it with brick. So easy! The brick was real but very thin and so easy to apply! Then we painted the shiny brass with a mat black spraypaint that was heatproof! The new look fits right into to our decor! Let’s end with this very very easy hack! We all love pillows and I have an easy way for anyone to make one! You do not even have to know how to sew a straight line. You can glue one instead! 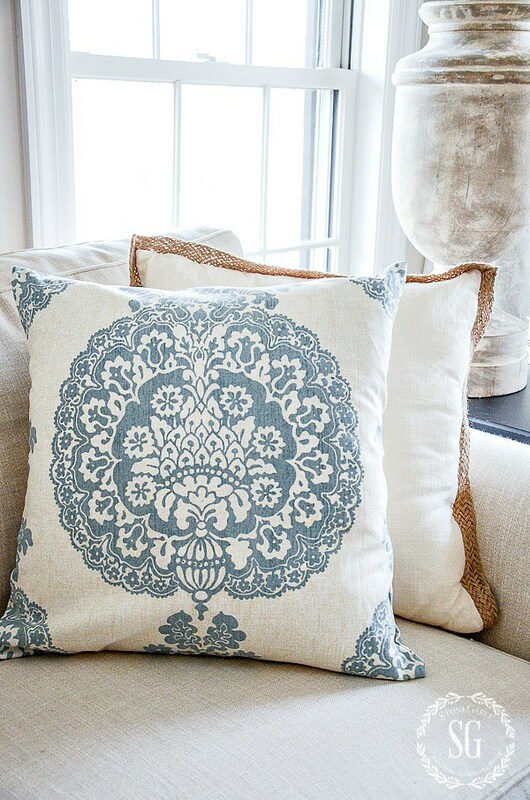 Just a warning… making pillows using a hot glue gun can be rather addictive! I have made so so many now! 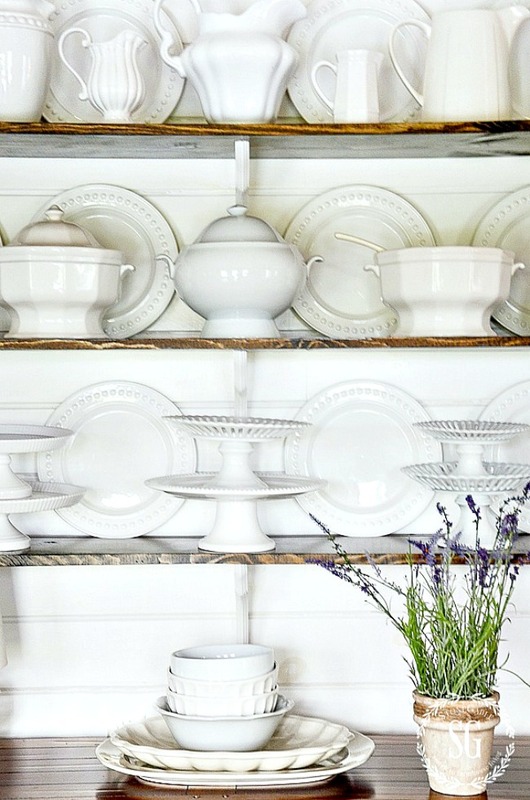 There you have it… my 10 plus 1 favorite StoneGable home decor hacks! Are you inspired yet? What hack could you use around your home? You might like to follow me on Pinterest and see all the great things I’m finding to pin every day HERE. Yvonne – I have been following you for a few months and although I enjoy all your blogs/posts, this one was the ABSOLUTE BEST for me! It had so many tips that are relevant to my decorating. I had to chuckle when I read about the fireplace hearth and surround were a dark green marble. This is exactly what I have and I have been trying to figure out what to do with it. I detest the green marble as it dates the house. So you can imagine how tickled I was to learn that you just covered OVER your marble with the thin brick veneer! If you would be so kind as to let me know where you found your brick veneer, I would so greatly appreciate it! Love your posts, your testimony of faith and your heart. Hi Joie, thank you so much for the lovely compliment. I LOVE what I do and want to help others! As for the brick veneer, I found it locally. And I suggest you do too. I went to a place that sells tile etc. and found the right brick and color there. Hope this helps. I love the color of your sofa!! It’s a nice beigee white? Where did u get it? Hi Christine, it is a soft white and it came from the Pottery Barn. But it has not held up well. I have lots of fabric I love but don’t know what to do with! I am now going to grab my glue gun!! Love your ideas! Some we have already done! I love your use of black painted and dark neutral details. So many rooms are totally white which to my unsophisticated eye appear to be floating without being grounded. 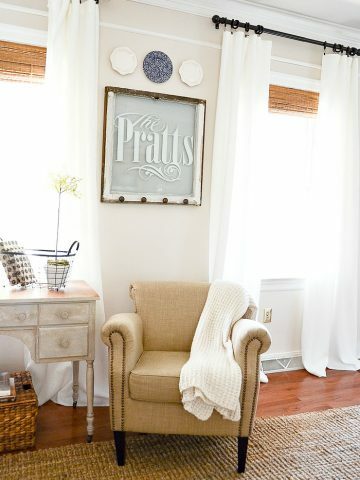 Thanks for sharing inexpensive ways to decorate. I love all your thrifty tips, your home is amazing!!! Thanks for sharing!! Love this post! 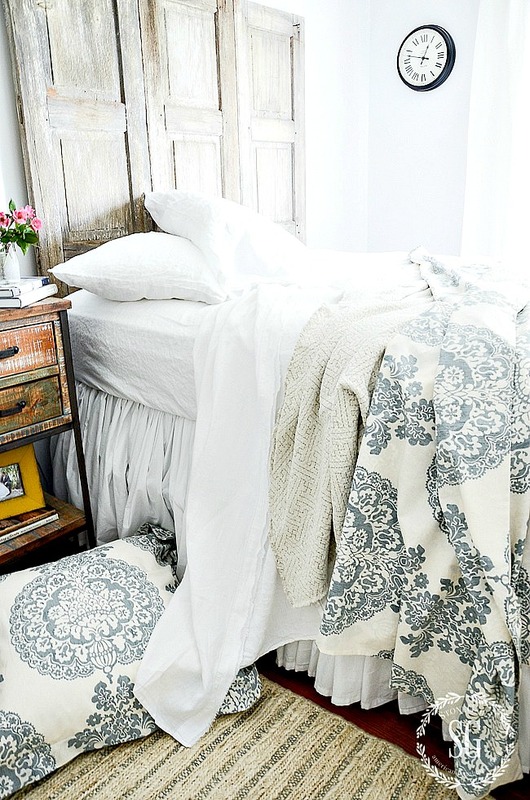 So many good ideas – especially the use of a duvet! Love your blog and all your ideas!! I would love to know where you got your striped rug. It is gorgeous!! 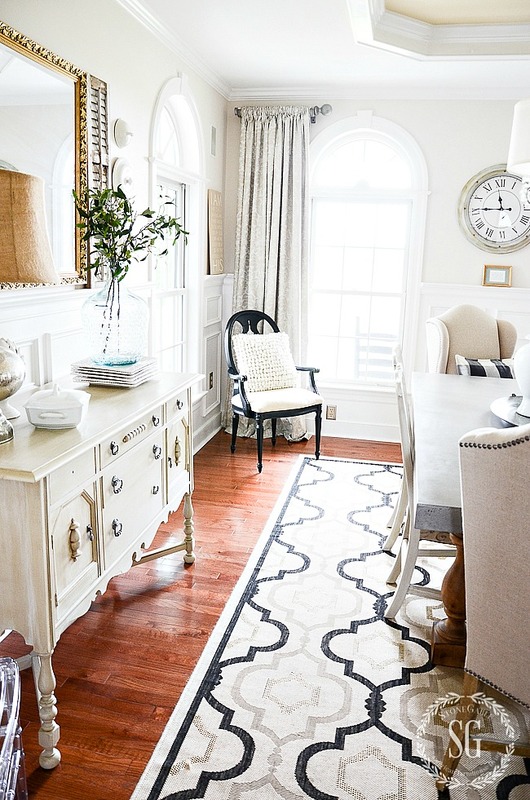 I have the same Ballard Design rug that’s in your dining room in my family room and I love it!! I love your style!! The rug you are asking about came from Joss and Main. I love your posts and hesitate to criticize, however, the layered rug photo looks like the before pic of how to remove 15 elements from your room. This may be a lesson in itself, coach us to see what works from our ‘eye-point’. Love everything…..where did you get the rolled wooden shades? Hi Cat. They are one of the biggest bargains in my home. I got them at Lowe’s. Love everything…..where did you get the rolled wooden shades? I want to replace all my mini blindes….is there an inexpensive source? I love the rug you have in the dining room photo. Could you tell me where you bought it? It makes me so sad to hear that you were sick at Christmas. Praying that you take it easy and allow yourself to get back to 100%. Seriously, get some well deserved rest. We’re not going anywhere! I love all of your fabulous decoding ideas!! Happy New Year!! Love your suggestions and of course I love your home. It is so inviting. That is what I strive for in my decorating, I want people be feel comfortable in home. I love all these ideas! Thank you for the inspiration! I’ve looked on your site and can’t find how you did the break around your fireplace surround. I have that marble stuff around mine and have been trying to find a way to cover it. What you did sounds perfect for my house also. Such beautiful rooms with lots of inspiration. I love all your ideas, such great talent! I am obsessed with your breakfast room! Everything is stunning. You are so talented. I really wish I could sew. Your home is lovely. Where do you find your seamless drop cloths? I find mine at Lowes. Hope this helps. Yvonne, you’ve just made me laugh out loud! We built our home 25 years ago, in the style of the time…shiny brass and green marble!!! I had to have EVERYTHING Verdi-Gris or green marble. Hahahaha! Great minds think alike. All of that is gone now, just like in your home, although I have to admit there are still a few fixtures that are brass. Thankfully, they don’t scream 1992!!! Love your posts so much, and all of your brilliant ideas!! Thank you! Nice hacks! 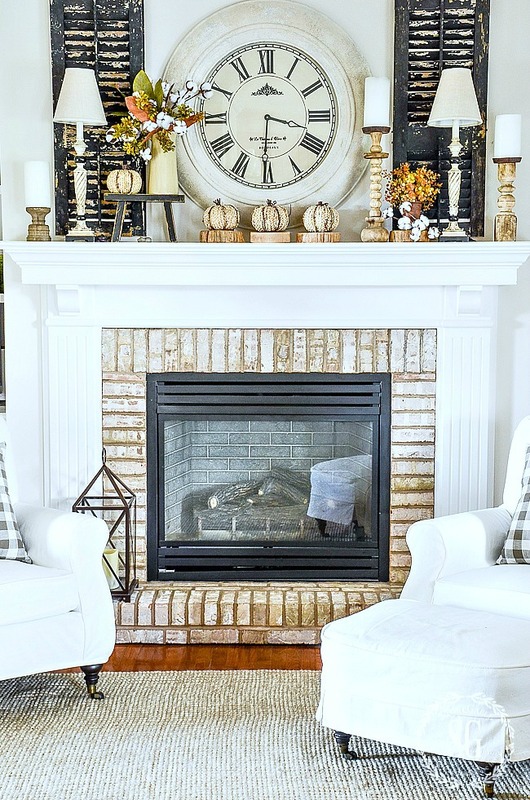 I can’t believe your fireplace wasn’t always brick…it looks great! Thank you for sharing these hacks. We need new bedding in all bedrooms and I will look for duvet covers and also stock up on glue sticks. I have a serious pillow habit and can’t wait to get started. I love pillows as much as you, Yvonne, so I MUST try the hot glue version. Since I do not sew, this opens the door to so many new pillows!!! I live the pillow idea- I don’t own a sewing machine but I do have a glue gun! – To give narrow crown molding extra oomph, place a narrow strip of molding a few inches from the bottom of the crown and paint the molding and the exposed wall the same color. This will give the optical illusion of one piece of crown mollding. – Paint (or paper) the back walls of book cases, hutches, China cabinets, etc. This creates depth and richness. We did this in our house and it looks terrific. Yvonne, I have gone to all your bedroom posts for ideas to refresh every one of our four bedrooms. We have guests coming in November. Thank you for your inspirations. Can you share what type of brick you used for fireplace project? I would love to try this with my fireplace. I went to a vendor who sold veneer stone. I’m so sorry that I cannot remember the specific name of the brick I have. I love looking at all of your photos. Your home is lovely. Thanks for the hacks!! Love the duvet idea! Great ideas as usual! I love the main rug in your living room. Is it sisal? 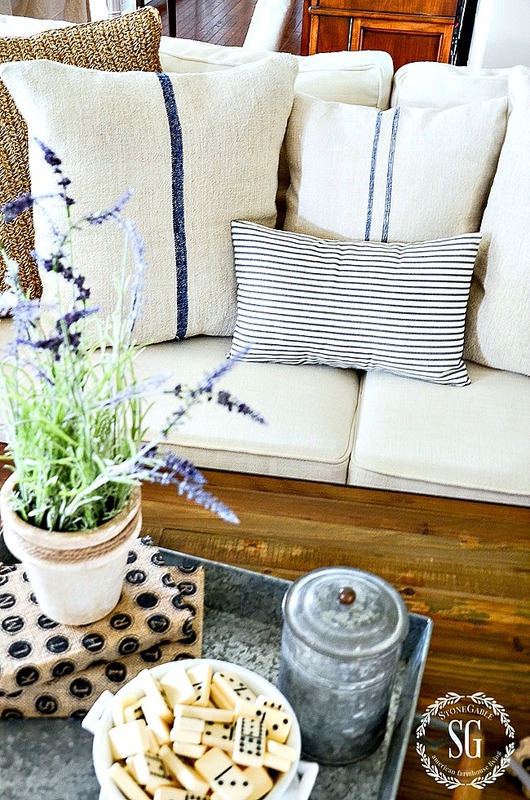 If so do you have any tips on purchasing a sisal rug? I have seen some in the big box stores around and they are very rough and very uninviting. Love your blog and the DT&T podcast. Yes, Pia the rug is sisal. One of the best tips I can give you is to buy a rug big enough for an area. So many of us buy a rug too small. Go bigger! I know what you mean about the rough feeling of some sisal rugs. I can usually tell just by looking at it. The rug in the living room is very soft. I love everyone of these hacks! 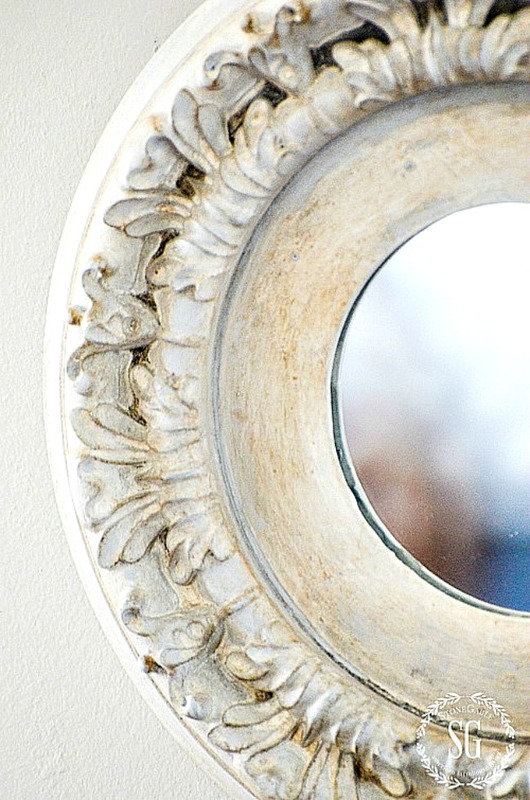 One of the projects on my list for the winter is to make some of the medallion mirrors, I absolutely love those! I also love the white bed skirt in the guest bedroom. I have been looking forever for one that has lots of gathering like you have, but I am never satisfied with what I find. Did you make it too? HI VIVAIAN! I found someone on ebay who made if for me. It was long ago and I’m sorry I forgot the source. Great ideas!! Thanks for sharing!! Thanks for all the great ideas! You are the best.